Innovative insulation meets rugged round-to-square design with these 3 bold and stylish, triple-insulated steel bottles that will absolutely turn heads at the office, coffee shop or PTA meeting. Even more of a head turner, every purchase sends much needed funding to Ocean Conservancy's Trash Free Seas Initiative® to aid in ocean cleanup and educational programs to help offset the global issue of plastics in the ocean, much of which are single-use plastic water bottles. Hydrate and be a planet saving superhero at the same time. 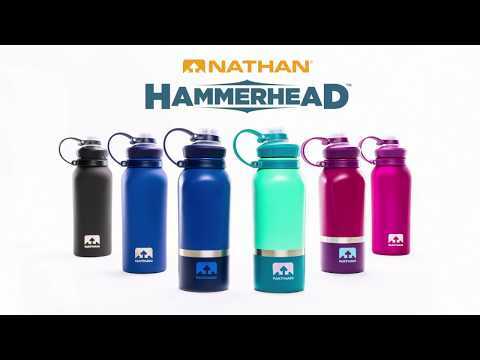 HammerHead 40oz Steel Insulated Bottle is rated 5.0 out of 5 by 3. Rated 5 out of 5 by Lloyd from Great style and function! I bought this item in place of a smaller one that I had to refill a number of times throughout the day and I am very pleased that it keeps my water cold all day long! This is my first Nathan product and I will definitely be looking to see what other items you have that I can use. Rated 5 out of 5 by Anonymous from Best bottle ever Holds so much water, and even if you leave the bottle out overnight, the water will be just as cold the next morning! Rated 5 out of 5 by Yesenia R. from Awesomesauce! Totally Love my Hammerhead Bottle. I can stay Hydrated in style throughout the day. Best Bottle I have ever owned!